FROZEN LATITUDES is a fine art photo book published at Seltmann and Söhne (Germany) presenting the beauty of pristine High Arctic landscapes. It is portraying the morphology of ice landscapes from some of the remotest places on earth in Greenland and Franz Josef Land (Russian Arctic). 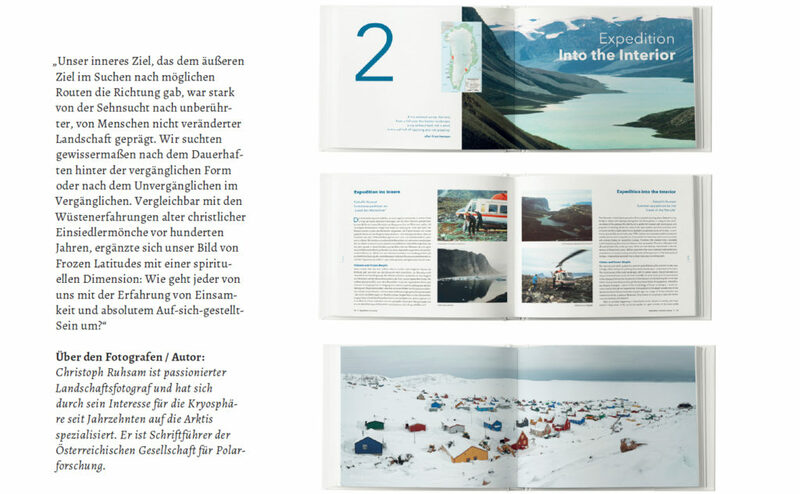 The bilingual texts in English and German tell stories about my first-hand experiences when ranging through the Arctic in search for Pure Landscapes. The internationally renown Austrian glaciologist and board member of the Austrian Polar Research Institute APRI Professor Wolfgang Schöner looks at the scientific perspectives of the Cryosphere and how it is affected by Global Warming. FROZEN LATITUDES is presenting rare panoramic views of the High Arctic solely formed by natural forces such as wind, water and ice. They are perceived as existing since the very early times of the Earth’s Genesis. Animals and artifacts often appear unexpectedly in these landscapes and set accents that emphasize the vastness of the nature with its inherent impression of permanence. It is my photographic challenge to capture the everlasting natural changes which are hard to recognize by human scales. Cryogenesis describes the physical processes of repeated freezing and thawing of Earth’ materials. Influenced by climate, earth-atmosphere interactions and the properties of the soils, it shapes the morphology of the landscape affected by permafrost which creates an unexpected variety of Frozen Morphs. My photographic approach results from the compound words in Cryo-Genesis: photos of the cryosphere’s landscape paint a picture of the earth’s Genesis where landscapes are exclusively created and moulded by natural forces. These Frozen Morphs show the striking aspects of High Arctic landscapes and reveal the eternal in the transient. My photos highlight the incredibly beautiful landscape consisting of simple, naturally shaped forms which have been created over millennia giving the impression of a never changing existence. Human impact causes change at a much faster pace than these natural, slow processes, imposing unpredictable changes on these active natural forces. Due to climate warming changes have accelerated at an unprecedented pace over the past centuries which has lead to a continuous transformation of pristine Genesis-landscape into cultivated land. For press release see here. Contact me for download information.